Spring Acre is around 175 km away from the Bandaranaike International Airport, Colombo. We would be happy to arrange an airport pick-up and all local transportation for a competitive price. You can opt for a drive to Spring Acre, which is around 5 hours from Colombo. 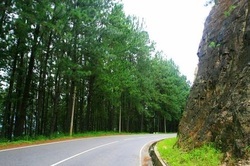 The first half of the journey on the A1 highway up to Peradeniya would take approximately 3 hours. From there, you get on to the A5 highway and pass some of the most breathtaking scenery in the island. The road is long and winding, yet the astounding mountain vistas of lush green valleys of tea and the misty peaks rising majestically in the distance will keep you entertained all the way. An alternative route to Nuwara Eliya would be to take a train ride from Colombo, which is an experience well worth having to catch a glimpse of local life up-country and admire the incredible views as they appear through the mist. We would be happy to arrange a pick up from the Nanu Oya Railway Station for a nominal charge for the short ride up to Spring Acre in Nuwara Eliya.